Oh boy! I believe things are going to be really exciting in Minnesota for a long time! As a long time Minnesota Viking fan, I am pretty jazzed up once again. I didn’t think I wold get so cranked-up ever again over something I don’t have control over. But, here I am and I believe the Vikings have what it takes to bring it home and WIN. We all remember “those moments” in sports that stick, and I am putting this up with the 1980 olympics when the USA hockey team won gold! I was down in Minneapolis most of the weekend at the boat show representing Larson FX fishing boats. 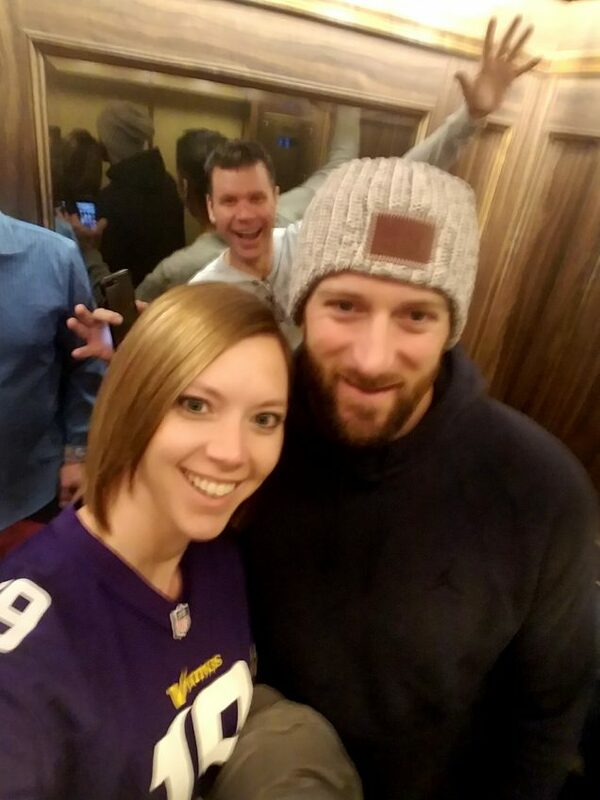 I think seeing the excitement up close and seeing some of the players up close made it a bit more real, I rode the elevator on Sunday morning with Brian Robison (MN Viking lineman) and photo-bombed he and another fan! So anyway, congratulations to this team and staff, and we will be praying for you. As for the boat show, it was good. The weather sucked on Thursday and we really didn’t see a good crowd until Saturday. But those that were there were quite impressed with the Larson line-up (www.larsonboatgroup.com). I’ve been running the Larson FX for 5 years now and it’s exciting to see that more and more people are coming on board with this quality fishing boat. I have my new 2020T on order and I’m excited to see what this year has in store. I know that we are right smack in the middle of a Minnesota winter, so I guess I will shift back to the ice fishing gear! On my way to the boat show last week, I dropped off my SnoBear (www.snobearusa.com) for some upgrades and it’s now ready to rock for the rest of the winter! I’m excited to get the SnoCub up here to the lakes area of Minnesota and put it use. We are planning on giving tours and using the cub in conjunction with our fishing guide service. The duo might even show up down on Lake Minnetonka over Super Bowl weekend, so we will keep you posted on that. In the meantime, we will be more than likely be storing the cub at the Quarterdeck Resort (www.Quarterdeckresort.com) on Gull Lake and shuttling people from one point to another on the Gull Lake Chain. If you would like to reserve a ride to and from the Brainerd Jaycees Ice Fishing Extravaganza, please call or email and we will get you on the schedule. Brother John and his Idaho buddies will take priority, but we will have room for more and we will do as many trips to and from that it takes.